Fully staffed by board-certified emergency medicine physicians, The Emergency Center is equipped to address chest pain, heart attacks, and other heart problems quickly. When it comes to heart emergencies, fast treatment can literally mean the difference between life and death. But heart attack symptoms aren’t always obvious, and long wait times in a hospital emergency room (ER) for vague symptoms, such as nausea or abdominal pain, could cost you valuable time. 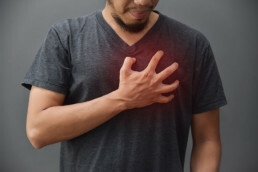 In addition, chest pain always warrants emergency medical attention, particularly if it is accompanied by a tearing sensation in the back or lasts for more than a few minutes and gets worse when you engage in any type of physical activity. As soon as a heart attack begins, injury to the heart muscle begins, so seeking help at the first sign of a potential problem could save your life or that of your loved one. The Emergency Center’s three 24-hour ERs in Arlington, Fort Worth, and San Antonio offer virtually no wait compared with hospital-based ERs, while offering the same advanced diagnostic technologies that you would find at a full-service hospital. All three centers feature board-certified emergency medicine physicians and intensive care unit- and ER-trained nurses, who can examine coronary arteries using a high-resolution, 64-slice computed tomography scanner. If signs of an impending heart attack are detected, we can quickly take action to stabilize you and, if needed, coordinate rapid transport to the nearest hospital. Read more about our emergency services.